CCCU. Enough Said: What's gone wrong with the language of politics? Quick overview Political rhetoric has become stale and the mistrust of politicians has made voters flock to populists who promise authenticity, honesty and truth instead of spin, evasiveness and lies. We've never had more information or more opportunity to debate the issues of the day. Yet the relationship between politicians, the media and the public is characterised by suspicion, mistrust and apathy. What has gone wrong? 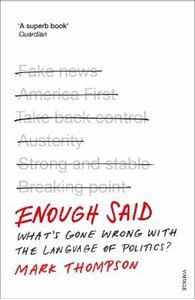 Enough Said reveals how political, social and technological change has transformed our political landscape - and how we talk about the issues that affect us all. Political rhetoric has become stale and the mistrust of politicians has made voters flock to populists who promise authenticity, honesty and truth instead of spin, evasiveness and lies.